This is an advanced multi-timeframe version of the popular Hull Moving Average (HMA). This is a demo version that has a limitation: the indicator is fully functional on NZDUSD (history + real time). Signals on other instruments can be seen only on the history. 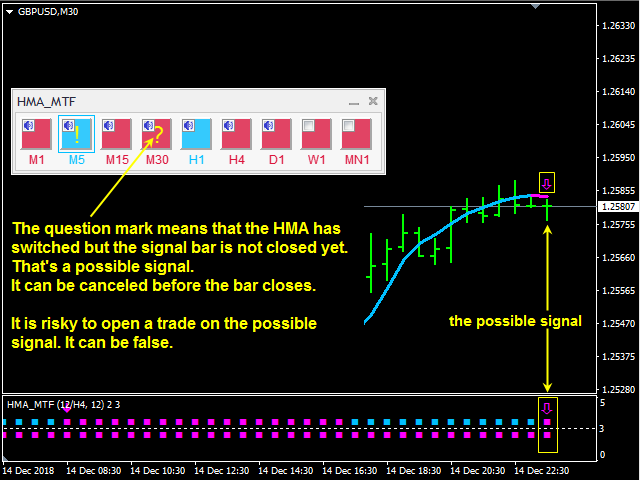 Graphical panel with HMA indicator data from all timeframes at the same time. If the HMA has switched its direction on any timeframe, a question mark or exclamation mark is displayed on the panel, accompanied by a text and audio message. The messages can be configured separately for each timeframe using the corresponding checkboxes. The indicator is located in a separate window, so as not to overload the main chart window. It combines HMA data from two timeframes on the same chart: the current TF and the higher TF, which is set in the parameters. The HMA of the higher timeframe determines the trend, and the HMA of the current timeframe determines the current short-term movements. The indicator splits signals of the higher TF on Possible and Final signals. 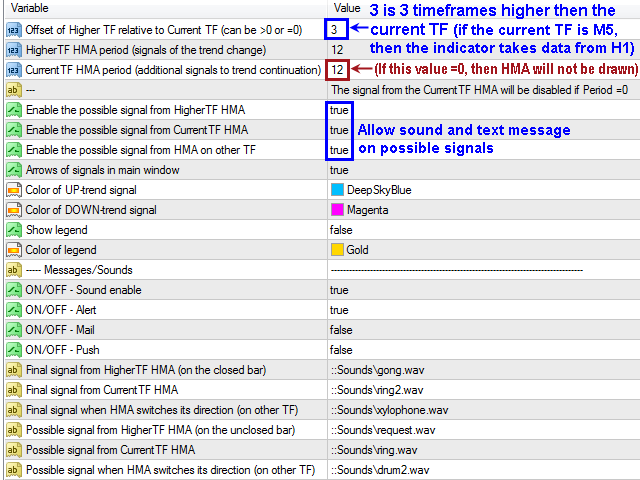 The possible signal is generated when the HMA color is switched and when the bar of the higher TF is not closed yet. The possible signal is displayed on the graphic panel with a question mark. 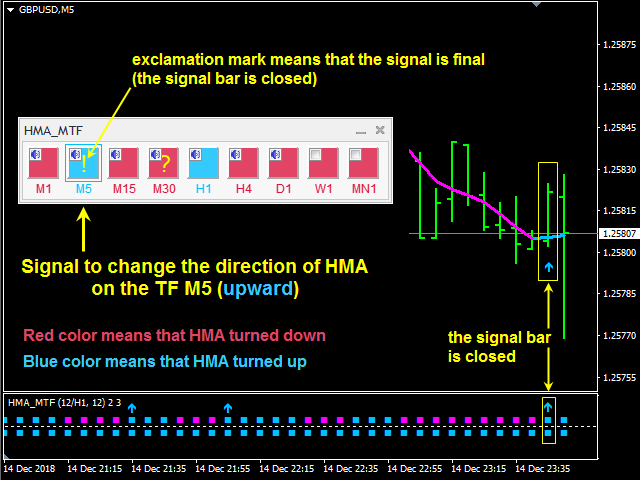 It is risky to open a deal on this signal, because it can be canceled if the HMA color is restored before closing the higher TF bar. However, the possible signal allows you to open a trade at the best price. The possible signal can be switched off. 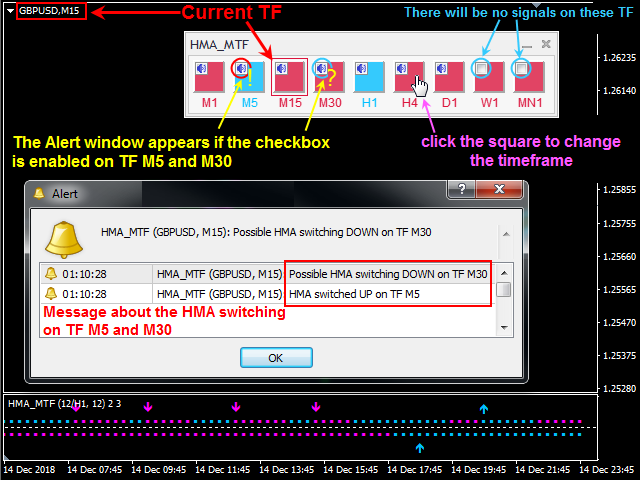 The final signal is generated by switching the color of the HMA of the higher TF and the bar of the higher TF has already closed. This signal is never redrawn. The final signal is displayed on the graphic panel with an exclamation mark. The signal arrows can be displayed both in the subwindow and in the main window. Information about the signal is displayed in the message box and duplicated by sound. It also supports sending email and push messages to mobile devices. 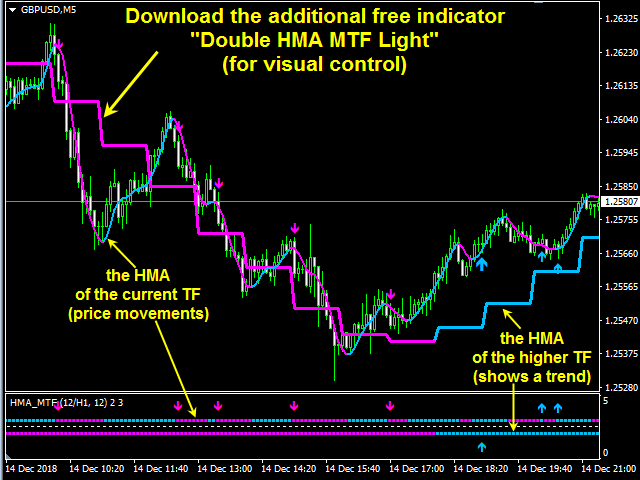 For easy visualization of the indicator’s job, use the free Double HMA MTF Light indicator, which displays HMA data from the current TF and the higher TF in the main window of the chart. Watch a video describing the operation of the indicator and recording of trades in real time. 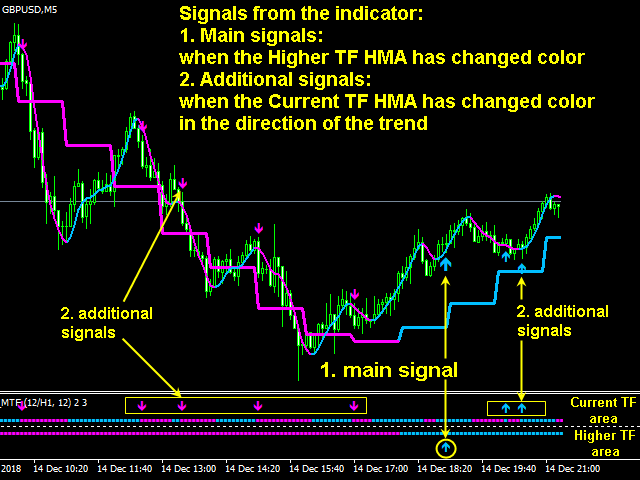 CurrentTF HMA period (additional signals to trend continuation) – the HMA period from the current timeframe (change of HMA color from the current TF is change the direction of the current price movement. This is additional signals). If this parameter =0 then the signal from the CurrentTF HMA will be disabled. Fixed a bug that did not change the color of the HMA on the multi-timeframe graphics panel.